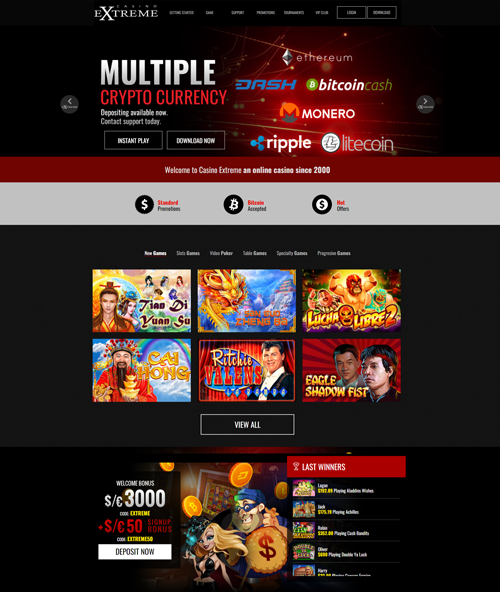 Casino Extreme presents a hybrid model in terms of payment methods, accepting both fiat currencies and cryptocurrencies as a deposit method. 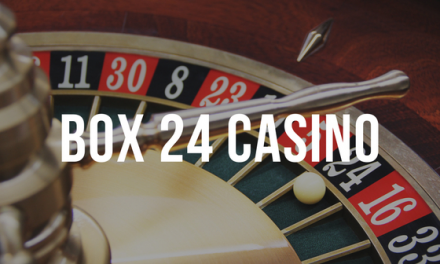 Offering over 180 games that range from Blackjack and Craps to Slots and Roulette, Casino Extreme is a fully regulated casino with a number of Seals of Approval, giving the necessary security for any player to join in. To register, players do need to be at least 18 years old, and to be in a country where online gambling is legal, something that does excludes countries like Indonesia, Philippines and Malaysia, among a few others. Players from the USA, UK and Canada are accepted. Gameplay at Casino Extreme can be done via browser, software download or mobile, with the same account across devices. 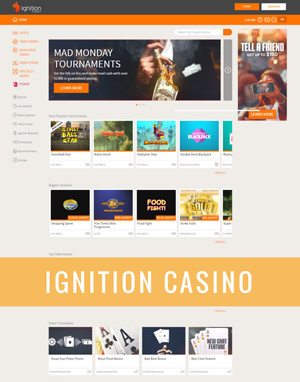 Realtime Gaming is the software powering the Casino, guaranteeing secure computer gaming. All the main gaming categories are present on Casino Extreme: Slots, Blackjack, Roulette and Video Poker. 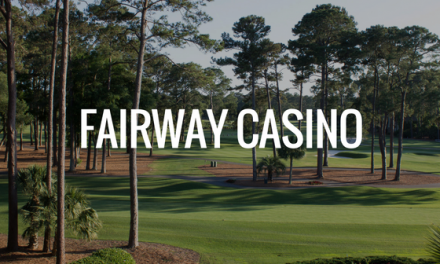 Not all the existing 180 games fall under these categories, and that is why War, Keno, Craps, Pai Gow Poker, Baccarat and many others are also present at the site. All of these games can be played with real money of for free, something that works like a practice mode before the player actually makes a real-money deposit into the account. The main games page at Casino Extreme has 5 sections: Slots, Video Poker, Table Games, Specialty Games and Progressives. The slots section presents 12 games with instant play or download options available, but many more slots can be loaded simply by pressing a button. Bonkers and Bubble Bubble are some of the titles available. The players have at their disposal quite a few Video Poker games: titles like Bonus Poker, Deuces Wild or Aces & Eights, available in standard, 3, 10, 52 or 100 cards versions. The existing table games at Casino Extreme are 19 and include Baccarat, 21 Blackjack, Craps, Roulette, Pai Gow, among others. In the specialty games category there are titles like Keno, Magic 7s, European and French Roulette, and Hot Dice. Those looking for the huge Jackpots will be happy to know that 10 Progressive Jackpots are are available, namely Caribbean Hold’em or Megasaur. Tournament play is available too at Casino Extreme, where new tournaments begin almost on a daily basis. A complete page with dates, type of game, buy in value and prizes is available at the site. Casino Extreme offers a sign up bonus of $50 when the player opens the account. Apart from this, there is also a welcome bonus that can go up to $3.000, with 100% match deposits of $500, on the first 6 deposits. Additionally, 200% match bonuses are offered on a first deposit between $20 and $200 with Paysafe Card, Upay Card, Bitcoin, Neteller, Skrill and EcoPayz. Other Daily promotions are available, and a full section of the site is dedicated in explaining then in detail. The prizes range from cashback and free spins to super bonuses of almost 1000%. Casino Extreme also features a VIP Lounge with 5 levels: Silver, Gold, Platinum, Super Platinum and Double Diamond, with increasing and exclusive bonuses. Making deposits at Casino Extreme is instant and no fees are charged, and can be done with VISA, MasterCard, Paysafe Card, Upay Card, Bitcoin, Neteller, Skrill and EcoPayz. Withdraws are equally instant and with no fees, but cannot be done with VISA and MasterCard. Apart from Bitcoin, also Ethereum, Litecoin, Bitcoin Cash, Dash, Monero, Ripple and DogeCoin are available for deposits and withdrawals. Support is available 24/7 by live chat, email, phone or fax, and Casino Extreme also features a blog with all the latest news and promotions. All the mentioned above along with an active Curacao Egaming License, make Casino Extreme a safe place for any player, especially attractive for cryptocurrency adopters.